La Palma has a diverse landscape of volcanoes, pine forests and vineyards. Unspoilt by mass tourism, the island's ancient footpaths, the 'Caminos Reales' are a walker's delight. Hike through quiet rural landscapes, deep ravines and along countless flower-lined paths. Trekkers' paradise - Well-marked trails through tranquil and varied landscapes. On arrival at the airport an included taxi transfer takes you to the colonial town of Santa Cruz de la Palma. If you arrive early, you'll have plenty of time to admire the beautiful architecture and Canarian pine balconies of the island's capital. Walk along the cobbled Calle Real and colourful narrow side streets, with every house painted a different shade. Today starts with an included taxi transfer to one of the hidden corners of the island: Los Franceses. Walk along a breathtaking route with impressive views along the Camino Real or 'royal roads', a network of trails used by the inhabitants of the island until the middle of the last century to pass through difficult areas to transit, usually with animals laden in supplies. Today you walk along the coast and from ravine to ravine. This is a very green part of the island with much vegetation. Going past the hamlet of La Tosca with its magnificent dragon trees, the route ends at the hotel in Barlovento, your base for the next two nights. Today's 12km walk is expected to take about 4 to 4.5 hours and you will ascend 750m and descend 550m. This morning's included taxi transfer takes you to the north of the island and the cloud forest of Los Tilos. Here you walk in the UNESCO nature reserve. This sub-tropical rain forest contains hundreds of plant species some of which are not found anywhere else in the world. Walk through the beautiful laurel forest where the clouds hang from the tips of branches and giant ferns. Follow narrow tunnels to the springs of Marcos and Cordero. This wild biosphere reserve covers 5% of the island. Today's walk ends in Los Sauces from where you will be driven back to the hotel. There is the option to end the walk in Los Tilos, shortening today's route by 5km. Today's 18km walk is expected to take about 7 hours and you will ascend 300m and descend 1300m. After an included taxi ride to the foot of Pico de La Nieve (2039m) today's walk begins. Hike along the edge of the deep Caldera de Taburiente, the largest erosion crater in the world. Following well-marked trails, a long descent begins through pine forests and the so-called Reventon trail until you reach the Virgen del Pino chapel. From here you will be driven to Los Llanos de Aridane where you spend the next two nights. This modern town is on the west side of the Island and surrounded by farmland. Nearby it has beautiful coves, beaches and a town centre worth exploring, particularly the church of Nuestra Senora de Los Remedios which contains a 16th century image of the Virgin Mary. Today's 16km walk is expected to take about 6 hours and you will ascend 300m and descend 1250m. Starting with an included taxi ride to Los Brecitos, at the heart of the Caldera de Taburiente National Park, you begin your descent to the bed of the Taburiente River. Then you walk toward the Roque Idafe, a natural stone pillar and with a special meaning for the inhabitants of the island as it was once worshiped as the Tree of Life. Today you will also see a colourful waterfall, dyed by the sulphur generated by the Caldera. A taxi will be arranged to take you back to Los Llanos de Aridane at the end of the route. Today's 16.5km walk is expected to take about 6 hours and you will ascend 250m and descend 900m. Once again we start with an included taxi transfer to the foot of the Pico Birigoyo, the El Pilar recreational area. Here begins a walk through the pine forest then a dusty trail along the many volcanoes of Cumbre Vieja, with impressive views, weather permitting. The route ends in Fuencaliente (also known as Los Canarios) right off the beaten track with a landscape of volcanoes, vineyards and empty beaches; you will find very few tourists here. Today's 17km walk is expected to take about 6 hours and you will ascend 550m and descend 1200m. From the village of Fuencaliente you walk first to the volcano of San Antonio (there is an entrance fee of 3.50 euros to be paid locally). From the top you can see the youngest of the volcanoes on La Palma: TeneguIa, 'born' in 1971. The route goes past the TeneguIa volcano following one of the lava flows which brings you to the lighthouse, at the southernmost point of the island. Walking 1km further to the west, you arrive at the beach, where you can have a refreshing dip in the natural crystal-clear rock pools originated, a lovely way to relax and mark the end of your walking holiday. An included taxi transfer will take you back to Santa Cruz de La Palma. Today's 9km walk is expected to take about 3 hours and you will ascend 300m and descend 1025m. After breakfast you will have an included taxi transfer to the airport. Bring some lightweight clothing for pleasant, balmy days (including shorts for day walks), but remember that temperatures drop with altitude and that evenings may be cool so a warm sweater or fleece is essential. As mountain weather is changeable it is important to bring a waterproof and windproof outer garment. Walking or trail boots with good ankle support are essential, plus comfortable trainersandals for relaxing. Please note that you will be crossing streams and small rivers so your footwear may get wet. Bring one main piece of baggage as per your airline luggage allowance, maximum 20 kg per person. Remember you may need to carry your luggage at times so don't overload yourself. Luggage transfers between hotels are normally arranged by the hoteliers. Mark your bags clearly and leave them at the place and time arranged with them. Bring a water bottle, torch, sunhat, sunscreen and sunglasses. A trekking pole is recommended for the steep descents and crossing streamsmall rivers. Canary Islands ADAC. Scale: 1:150,000. Overview of the islands in fairly good detail. Smaller islands like La Gomera do not receive much attention, but still the best choice for a general map. There are no local fees on this holiday. La Palma Airport is served by scheduled airlines (including British Airways, Air Europa and Iberia) direct from UK airports including London and Manchester. Airport taxi transfers to/from the first and last night accommodation are included in the price of this holiday. The Canary Islands: Visas are not required by UK, Australian, New Zealand, US and Canadian citizens. Other nationalities should consult their local embassy or consular office. 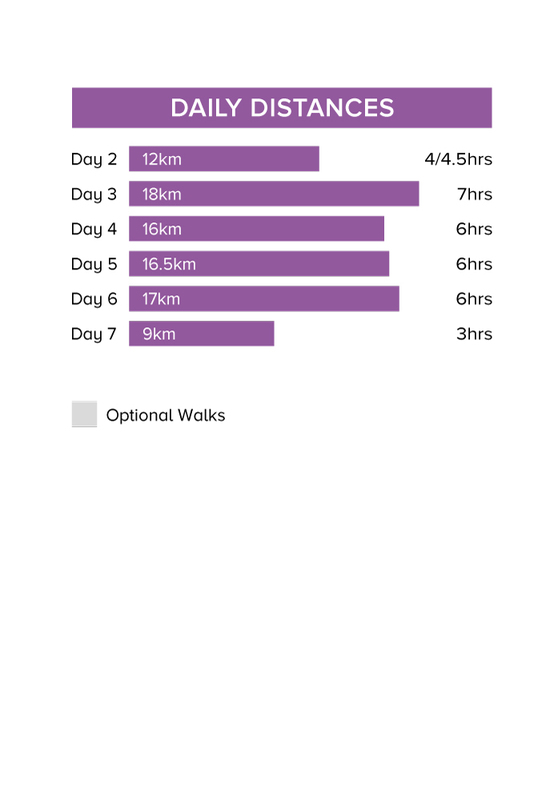 On this journey you walk 88km over 6 days (an average of 14.5km a day). There are long walking routes of 4.5 to 7hrs, some with tough ascents or descents, with a maximum ascent of 750m on one day. We have graded this trip as moderate to challenging. Tue 1 Jan 2019 - Thu 31 Oct 2019 Your trip can depart anytime between the above dates. Contact us for triple room requests and solo traveller prices. 00:00 at La Palma Airport. Fri 1 Nov 2019 - Sun 22 Dec 2019 Your trip can depart anytime between the above dates. Contact us for triple room requests and solo traveller prices. Mon 23 Dec 2019 - Tue 31 Dec 2019 Your trip can depart anytime between the above dates. Contact us for triple room requests and solo traveller prices. Wed 1 Jan 2020 - Thu 30 Apr 2020 Your trip can depart anytime between the above dates. Contact us for triple room requests and solo traveller prices. Fri 1 May 2020 - Sat 31 Oct 2020 Your trip can depart anytime between the above dates. Contact us for triple room requests and solo traveller prices. Sun 1 Nov 2020 - Thu 31 Dec 2020 Your trip can depart anytime between the above dates. Contact us for triple room requests and solo traveller prices.